In these type of questions, The information is given about the different relationships among Different people. The relationship can be direct or indirect . After examining the question carefully we have to identify the relationship between people and answer the given questions Accordingly. Parents = Mother and father. Siblings = Brother, Sister, Cousins. Spouse = Husband and wife. Aunt : In English Aunt mean father’s sister, mother’s sister, father’s brother’s wife or mother’s brother’s wife. Uncle : In english Uncle mean father’s brother, Mother’s brother, Father’s sister’s husband’s, Mother’s sister’s husband. Niece : brother’s and sister’s daughter. Nephew : Brother’s and Sister’s son. Cousins : Children of aunt and uncle . Mother in-law : Mother of Spouse. Sister in-law could be sister of spouse, wife of brother, wife of spouse brother. Brother in-law could be brother of spouse, husband of sister, husband of spouse sister. Q1. Introducing a man, a Woman said” his mother is the only daughter of my father”. how is the man related to the woman? Q2.Pointing to a girl in the photograph, Amar said ,” her mother’s brother is the only son of my mother’s father.” how is the girl’s mother related to Amar? Q3. L is the Father of P, who is the father of S.M is the grandmother of R, who is the son of O.N is paternal uncle of R, who is brother of S. What is the relationship between O and R? Q4 A,B,C,D,E and F are 6 member of a family.A is the son of C. and E is the daughter of A.D is the daughter of F who is the mother of E.B is the spouse of C. Find number of male and Female .Also find the relationship between B and D? Q5. Which of the following indicates that ‘D is niece of A’? Q6. What will come in the place of question mark (?) in the expression ‘A+B@C&D?E’ if it indicates that C is father in law of E? A has two daughters and only one son. Q8. Which of the following can be the correct conclusion drawn from the expression? 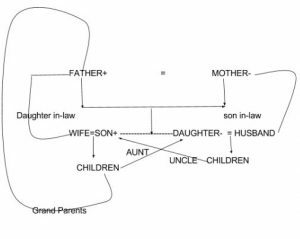 Q (9-10)In a family there are two fathers, two mothers, one sister, one brother, two daughter, one mother-in-law, one daughter-in-law, two sister-in-law, one son, one grandfather, one grand mother and one granddaughter. Q 9.How many married couples are there in the family ? Q 10. How many female members are their in family? Join us on Telegram and Facebook for BANK exam is also asked in other government exam like BANK IBPS SO RRB SSC. These notes are prepared by Supriya Kundu who is one of the best teacher in this field.If any question please ask below.